Rivers on Mars" produces edgy performances that give the audience a chance to share the band's sense of exploration, euphoria, and danger. 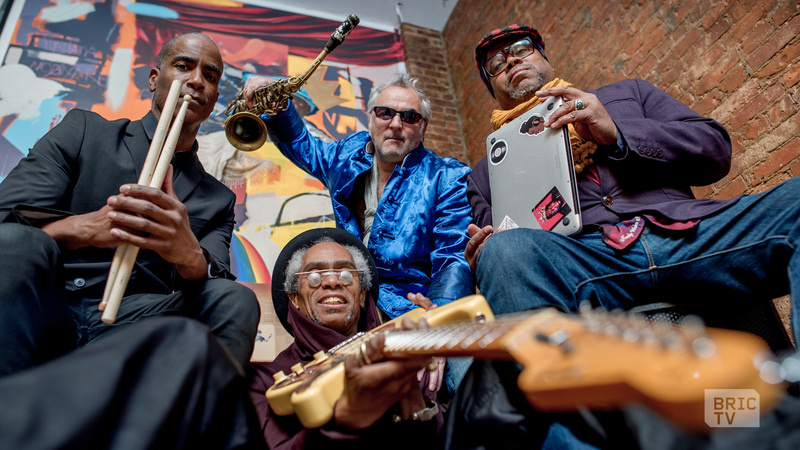 Drawing on their previous work with groups like Burnt Sugar Arkestra, Sun Ra, Red Baraat, Squelch, and The Last Poets, this futuristic four-piece ensemble specializes in conjuring up 25th Century Dance Music. They create a world of abstract, gravity-free groove --- trance-inducing waves of interstellar melody; splashes of searing guitar and harmonic counterpoint; loops and sonic mayhem bubbling up spontaneously via laptop surging above a deep riverbed of rhythm liberated from the earthly traditions of jazz, funk, trip-hop, and afro-beat. Greg Tate on laptop, On Ka'a Davis on guitar, Chris Eddleton on Drums and Avram Fefer on sax, bass clarinet and flute. **PLEASE NOTE: This is also a RECORD RELEASE EVENT! B-Side is BRIC TV's live in-studio music series and screening, featuring performances from emerging and established musicians -- free of charge. The in-studio seating is very limited and is FIRST COME, FIRST SERVED. RSVPs do not guarantee entry and are used solely for measuring attendance. These performances are open to the public, however our studio space is limited. For this reason, the performance will be broadcasted on the Stoop simultaneously.